As random as it sounds, I saw Christmas as a pivotal point in our journey to have a baby. I think I've shared this on the blog before, but one of my biggest fears was that Parker and I wouldn't be able to have kids. You never really know until you get to that point, so it was always a concern of mine. We decided to start trying to have a baby in March. I remember thinking "If I'm not pregnant by Christmas, something might be wrong". Obviously everyone is different and some get pregnant by sneezing and others take years to conceive a child. Even knowing this, I knew Christmas would be hard if I looked down at my stomach and didn't see a baby in there. Here we are. It's Christmas. I can look down at my belly and clearly see there is no baby in there. It's flat. As I look at my body and see there is no other life inside of me, I don't feel any of the emotions of fear and doubt that I thought a childless Christmas would represent. It's quite different. Instead, I know I am a mom. We were given the gift of a child, just like we had hoped and prayed. Our baby is just spending her first Christmas in Heaven instead of in my tummy. God may have taken her home far sooner than Parker and I ever wanted, but he did make us parents this Christmas. Taylor Grace is going to have one awesome first Christmas in Heaven, and we will have a wonderful Christmas knowing she is safe and happy with Jesus while she waits for us to one day get there. I know waking up Christmas morning and not seeing a big, 6 month pregnant belly like I should be seeing will be hard, but I also know that my empty belly doesn't mean we don't have a baby. We do. We got to become parents this year. God is good. He is good all the time. Prayers coming your way this Christmas! to echo the others, amen and amen sweet friend. 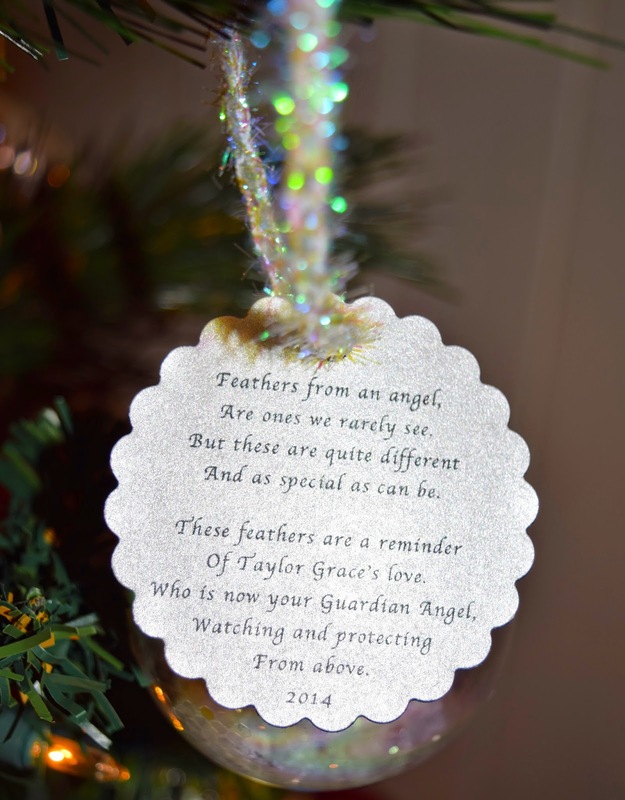 and that ornament...so beautiful and so true! I am continuing to pray for you as you guys go through this journey! Praying for you, sweet friend!!! And not to be totally off topic, but I just saw your new blog design and I love it! Thinking of you always sweet friend! I simply adore the way you are choosing to honor God through your heartbreak! Thank you for being such a strong image of the hope and love that the Savior delivers. Chelsea, you are so beautifully inspiring. Beautiful post girl. I hope you can at least find comfort and peace knowing she's spending her 1st Christmas in heaven and what a joy that must be. I hope when you're ready God will provide you and Parker with a sibling for Taylor Grace as I know it will be hard but you have her as your guardian angel and in heaven looking after you. Tears. You are already such loving parents. All a part of the journey He chose for you. You have the kindest, purist heart, even while your journey isn't the easiest. You offer so much encouragement and inspiration whether you realize it or not. You have a beautiful soul, Chelsea. Awe, so sweet. My husband and I tried a couple times and I swore each month I was pregnant. My body would feel slightly different, I'd think I was showing some type of symptoms, but at the end of the day, nothing. You never think you're plan may not work out like you had planned. May god continue to give y'all the strength you need to stay strong and positive. 2 Years of Blogging: Check!